PRESS CONFERENCE BY JEAN-CLAUDE JUNCKER: 21 MAY, 14:00 | Jean-Claude Juncker | Experience. Solidarity. Future. Jean-Claude Juncker, the candidate of the European People’s Party for President of the European Commission, will, today in Brussels, hold a press conference before the beginning of the European elections. The elections will start on Thursday, with polls opening in the United Kingdom and the Netherlands. 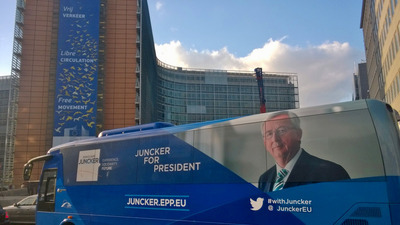 Immediately prior to the press conference, Jean-Claude Juncker will receive the five “Juncker for President” campaign vans of the Youth of the European People’s Party (YEPP), which have been campaigning for him in 25 countries and 68 cities. YEPP representatives will present Jean-Claude Juncker with a number of messages that they have gathered during the road trip and which contain the priorities and concerns of the youth of Europe. At the press conference, Jean-Claude Juncker will refer to the messages and to the priorities that he will make his own; especially regarding youth unemployment and development. The European People’s Party will host an event in its Headquarters on Election Night (25 May). The EPP will provide journalists with a working area with internet connection in the Stanhope Hotel, in front of the EPP Headquarters. A list of various speakers who will be present at the event will be released on Thursday.